Honey bees are flying insects, and close relatives of wasps and ants. They are found on every continent on earth, except for Antarctica. 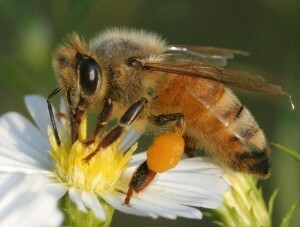 Honeybees are social insects that live in colonies. The hive population consists of a single queen, a few hundred drones, and thousands of worker bees. About one ounce of honey would fuel a honey bee’s flight around the world. Queen bees will lay as many as 2,000 eggs on a good day — an average of one every 45 seconds. The average central temperature of the brood nest is kept between 92 – 95 degrees Fahrenheit. The Americas have no native honey bees — early pioneers first brought them from Europe.